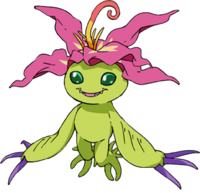 A Plant Digimon with a tropical flower blooming on its head. Although it evolved like a reptile from Tanemon, it is an unusual Type which is classified as a Plant based on its outward appearances and special qualities. During the day it opens up the flower and spreads its leaf-like arms to perform photosynthesis. It usually buries its root-like feet under the ground, and although it is absorbing nutrients, it is also able to walk. 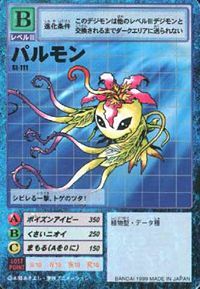 As for the flower on its head, when it is joyful or happy it will waft about a sweet fragrance, but when it is angered or senses danger, it releases a foul stench that will drive off even large Digimon. Its Special Move is entangling the opponent in ivy laced with a powerful toxin (Poison Ivy). If you suffer this attack, your body will be completely paralyzed. 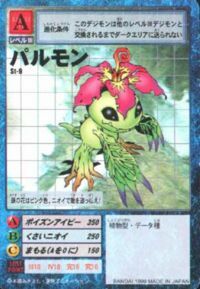 A Plant Digimon whose tropical flower bloomed on its head. 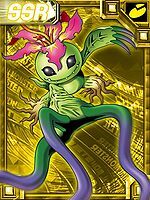 Although in reality it is a reptile, it is a very unusual Digimon which is classified as a Plant type due to its appearance. Usually, it plants its feet into the ground, photosynthesizing with the flower on its head and its body as well as absorbing nutrients, but it can also walk, doing so at times. 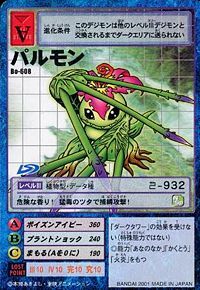 Its Special Move is tangling its long ivy, poisoning the opponent (Poison Ivy). A Digimon who has a flower blooming on its head. This flower changes scent depending on its mood; it lets out a good scent when it is in a good mood, but lets out a bad stench when its mood changes for the worse. 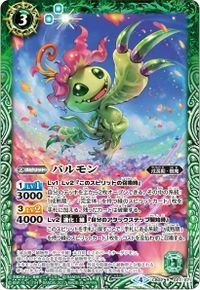 A Plant Digimon with a tropical flower blooming on its head. Although it evolved like a reptile from Tanemon, it is an unusual Type which is classified as a Plant based on its outward appearances and special qualities. During the day it opens up the flower and spreads its leaf-like arms to perform photosynthesis. 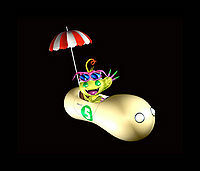 It usually buries its root-like feet under the ground, and although it is absorbing nutrients, it is also able to walk. n., Short for Palm Tree (「パルムツリー」 Parumu Tsurī). Palmon's fingers extend to grab or whip the enemy, also paralyzing them. Hit the opponent with leaves, claws them, or showers them with poisonous pollen. 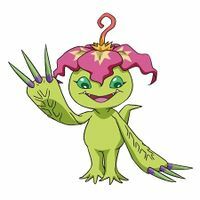 Kusai Nioi  Stinky Stench くさいニオイ N/A Stinking Attack Gives off a powerful stench that makes Digimon unwilling to fight it. Totemo Kusai Nioi  Very Stinky Stench とてもくさいニオイ N/A Very Stinking Smell Blows out a powerful poisonous smoke. ソーンスロー Sōn Surō Thrown Down Impales the opponent with her vines before throwing it. 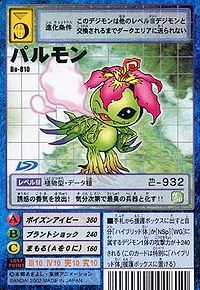 スリープスポア Surīpu Supoa Sleep Spores Shakes its petals, which releases spores that can put Digimon to sleep. Stabs upwards with its extended fingers. 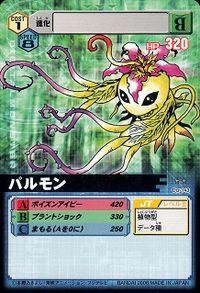 ルートストレッチ Rūto Sutorecchi Root Breaker Slashes a foe with its claws. Palmon is the partner of Tachikawa Mimi. Some Palmon are seen both the times the Chosen Children are at the Akiba Market. 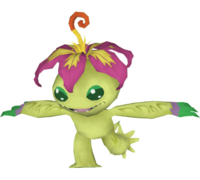 Palmon appears as an obtainable Child-level Vaccine type Digimon in Digimon World. 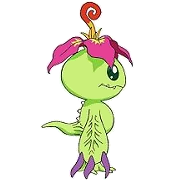 A Palmon NPC appears in the very south of Unwavering Forest, in where it'll be disguised as a flower along with other flowers of similar appearance. Trying to talk with the flower makes it reply saying that its a flower, and if the player repeatedly keeps talking to it, the flower will get annoyed and an angry Palmon will itself reveal, engaging a battle. After it has been defeated, Palmon will join the city, upgrading and replacing Tanemon's Meat Farm facility in where Palmon will handle out 3 daily pieces of Giant Meat, a kind of food that satisfies Digimon more than Tanemon's regular Meat, especially for the Champion Level. Palmon also sells Giant Meat by 500 Bits each after you got the 3 Daily pieces of Meat, unlike Tanemon. When Veggiemon has been recruited to the city, it'll replace Palmon's job, by handling out Sirloins, a much better type of Meat than Palmon's Giant Meats. 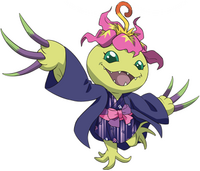 Upon contact with the enemy, Palmon's nails will extend and impale the enemy, poisoning them. Palmon evolves to Togemon (0+ DP). Evolves from Tanemon. Can evolve to Togemon. 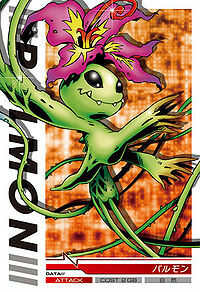 Palmon is an obtainable evolution of Lalamon. 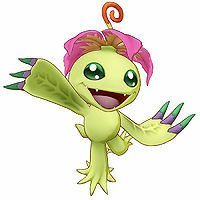 Palmon is an obtainable Vaccine Child-Level Digimon and belongs to the Jungle Troopers Field. 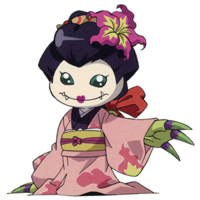 Evolves from Tanemon at Level 8 but to degenerate into it, it needs to be at least Level 3. Evolves into Togemon at Level 19 while having at least a minimum 60% percentage of friendship and a minimum Attack Stat of 95. Evolves into Mori Shellmon at Level 22, a minimum Defense Stat of 105 and a minimum Beast Experience Stat of 900. 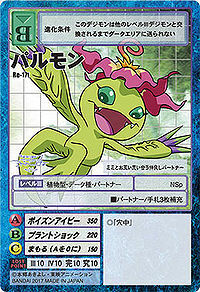 Palmon is an obtainable Digimon. Can be evolved from Tanemon. She can evolve further to Kiwimon, Togemon, Scumon or Vegimon. Palmon evolves into Togemon or Woodmon at level 11. 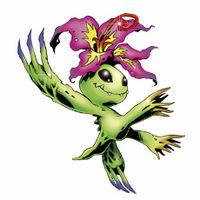 Palmon is one of the three starters. Its attribute is Plant. 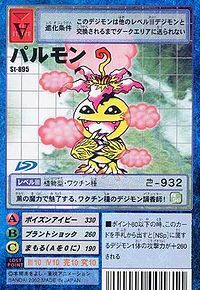 It digivolves from Tanemon and can digivolve into Togemon, Sunflowmon, Woodmon, Vegiemon, or Kuwagamon. Evolves from Tanemon. Can evolve to Leomon, Kuwagamon, Coelamon, Mojyamon or Nanimon. 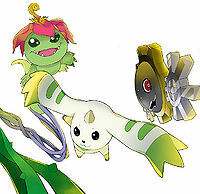 Palmon is a partner Digimon. Evolves from Tanemon and can evolve to Togemon. Evolves from Pyocomon. Can evolve to Togemon, Kiwimon, Woodmon or Red Vagimon. The flower on its head is pink. It drives enemies away with its stench! Its thorny ivy attack paralyzes the enemy! The Vaccine-attribute Digimon perfumer charms the opponent with its magical fragrance! A dangerous smell! It captures the enemy with its poison ivy! It emits an alluring fragrance, which changes into a putrid weapon depending on its mood!! It is good friends with its partner Mimi, and they love each other greatly. 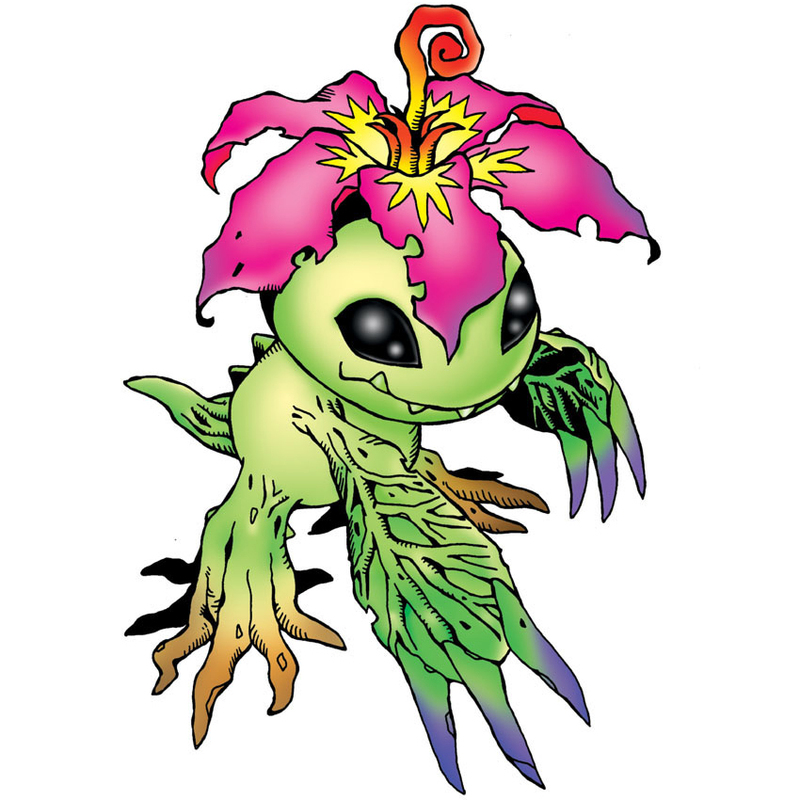 A rare type of Digimon that became a Plant type while undergoing reptile-like evolution. The tropical flower that blooms on its head emits different scents depending on its mood. It buries its feet into the ground in order to absorb nutrients. Tachikawa Mimi's Partner Digimon. 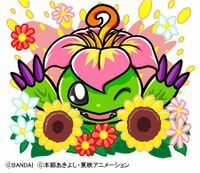 It is a Plant Digimon with a tropical flower blooming on its head. Although it evolved like a reptile from Tanemon, it is an unusual Type which is classified as a Plant based on its outward appearances and special qualities. During the day, it opens up the flower and spreads its leaf-like arms to perform photosynthesis. Digimon Adventure Fes. 2017 Digimon Adventure tri. ↑ Digimon Adventure: "Palmon, Raging Evolution!" This page was last modified on 10 April 2019, at 00:43.